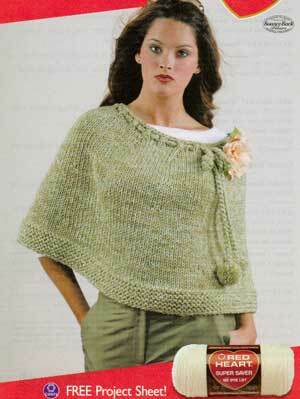 Poncho directions are for Size Small/Medium; changes for Size Large/Extra Large are in parentheses. Red Heart® Super Saver®, Art. E300 (8 ounce/452 yard skein): 8 (10) Ounces each No. 661 CA Frosty Green and No. 342 Light Thyme CB. Red Heart® Fiesta®, Art. E704 (6 ounce/330 yard skein): 8 (10) Ounces No. 6661 Meadow CA and Red Heart® Super Saver®, Art. E300 (8 ounce/452 yard skein): 8 (10) Ounces No. 342 Light Thyme CB. Circular Knitting Needle: 9mm [US 13] - 24". Crochet Hook: 8mm [US L-11]. GAUGE: 10 sts = 4"; 14 rnds = 4" in St st with double strand of yarn. Lower Circumference: 56 (68)" . With circular knitting needle, cast on 140 (170) sts. Join to work in the round, being careful that sts are not twisted. Place a marker on needle to indicate beginning and end of rnd. [K 1 rnd. P 1 rnd] 5 times for Garter st border. Now work in St st (K every rnd) until 5" from beg. Next Rnd: [K12 (15), K2tog] 10 times - 130 (160) sts. Work even in St st until 10" from beg. Next Rnd: [K11 (14), K2tog] 10 times - 120 (150) sts. Work even in St st until 15" from beg. Next Rnd: [K10 (13), K2tog] 10 times - 110 (140) sts. Next Rnd: [K9 (12), K2tog] 10 times - 100 (130) sts. Next Rnd: [K8 (11), K2tog] 10 times - 90 (120) sts. Next Rnd: [K7 (10), K2tog] 10 times - 80 (110) sts. Eyelet Rnd: * K2tog, yo; rep from * around. K 1 rnd. Bind off. Tie: With 2 strands of CA and 2 strands of CB held together as one and crochet hook, make a chain 70 (80)" long. Fasten off. Beg at center front, weave chain through the holes made by the yo of Eyelet Rnd. Make two 2" diameter pom poms and attach one at each end of tie. ABBREVIATIONS: beg = beginning; CA, CB = Colors A, B; K = knit; mm = millimeters; p= purl; rep = repeat: rnd = round; St st = Stockinette st; st(s) = stitch(es); tog = together; yo = yarn over; * = repeat whatever follows the * as indicated: [ ] = work directions in brackets the number of times specified.